It was liberation day, when the fascists were ousted. A national bank-holiday. 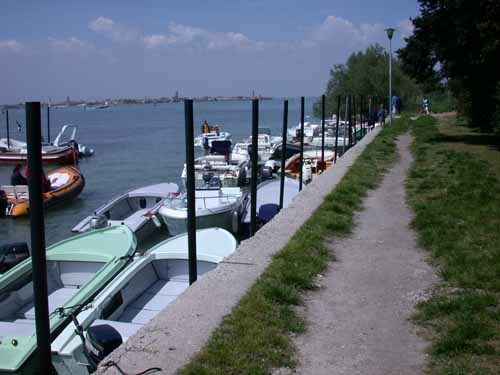 Today M and I took the Vaporetto to a wee island called Vignetto, out in the Venetian lagoon. I had been to the nearby agricultural island, Sant Erasmus, and the boat was quite desolate. This time, the boat we took was the 12:15, and it was PACKED! It sat at the pier for 20 minutes before leaving Venice, and filled, filled, filled. There was standing-room only, and that was scarce. I had thought I'd take M to a deserted island on which I had sighted a sweet little cafe. Not to happen. This horde of over 100 continued past the cafe ... we thought it best to follow them, swept up in their midst. They were of all ages, seemed not to be related. I couldn't tell by their appearance, but they were not yelling back and forth, as one might expect for an extended family. 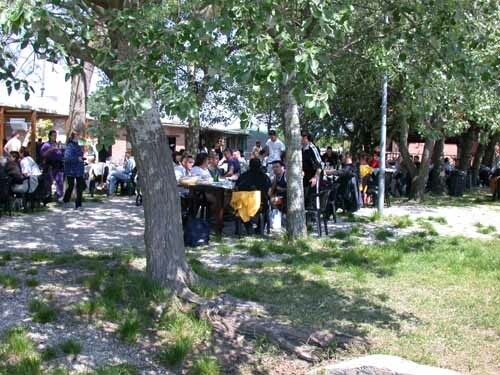 The group wound around and around to the far side of the island over a dirt track on this little agricultural island, til it came to the far side, ... to another, larger and much more informal cafe. Well, a bunch of empty family-style tables anyway. Seems they knew which restaurant to patronize. It was cafeteria style, get your table cloth, plates, set your table (or part thereof). Some tables 30 feet long. I took the one attached image of the group, but it gives little feeling of the open space, shade trees, kids playing (quietly), a few dogs running around (these are not taboo, as in the states). Lots of food. Get it yourself, on trays and carry it out. Pricing was rather like dim sum, $5 a plate, what mix of stuff do you want on this plate? Fish, risotto, veggies, a sort of micro whelp. Totally amazing altogether. And a total surprise. TOTAL! I had even just had a big breakfast back at home, using up the last of the eggs before we leave. But fasting was not to happen. The other image shows the boats double and triple-parked in the little canal down the middle of the island. Just like back in the real world of cars .... They came in everything. 6 gondolas. Some 25 purple-clothed gondolier types. I think it is some sort of racing scene, the (almost always) men stand 3-5 per boat, and row the little things at breakneck speed. I'd fall over if I tried it. It's almost time to move on...I have started to feel like I live here. People have started to recognize me. I think we will go out to the country for our last five days or so. People are leaving , things are winding down here. But the weather is getting more gorgeous everyday. We are ready to see some country side now. We think we will go off towards Parma and some hill towns south of that in the Apennines. The area is also know for good food. Believe it or not I think we will be ready to come home. See you soon.